I am in awe of this dark, roiling, mad affliction of a book. A marrow-creeping retelling of the Norse myth. The gods meet their cataclysmic end in this acclaimed work of fiction from the inimitable author of Possession and The Children’s Book, now in paperback. As the bombs of the Blitz rain down on Britain, one young girl is evacuated to the countryside. She is struggling to make sense of her new life, whose dark, war-ravaged days feel very removed from the peace and love being preached in church and at school. Then she is given a copy of Asgard and the Godsa book of ancient Norse mythsand her inner and outer worlds are transformed. She feels an instant kinship with these vivid, beautiful, terrifying tales of the end of the gods: they seem far more real, far more familiar during these precarious days. How could this child know that fifty years on, many of the birds and flowers she took for granted on her walks to school would become extinct? War, natural disaster, reckless gods, and the recognition of the world's impermanence are just some of the threads that Byatt weaves into this most timely of books. 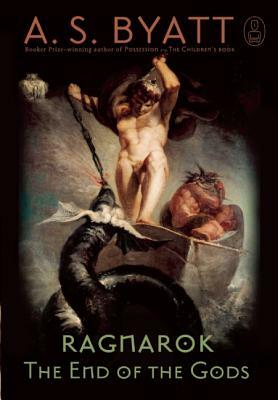 Linguistically stunning and imaginatively abundant, Ragnarok is a landmark piece of storytelling from one of the most brilliant minds and speakers of our generation” (The Independent).